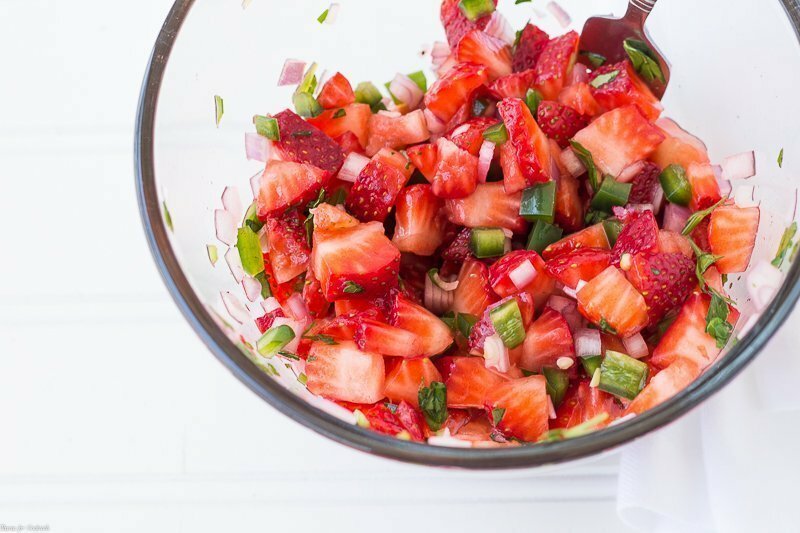 Seasonal strawberries combine with local produce in this sweet and spicy Strawberry Pico de Gallo. Made with diced strawberries, local jalapeño peppers, shallots, parsley and a touch of honey. I have to admit we have been snacking wayyyyy too much lately. And I don’t mean noshing on healthy fruits and veggies either. The kid has been bringing chips and cookies home from work that are such a temptation. 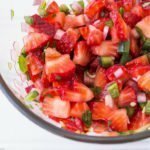 [bctt tweet=”Strawberry Pico de Gallo #summer #fresh #real #food” username=”thyme4cocktails”] His metabolism can handle the extreme carbs, but not this momma. It just makes me lazy after a while. So today I whipped but a batch of Strawberry Pico de Gallo and didn’t feel bad at all for eating a big bowl of it! Yes there were a few corn tortilla chips involved, but not too many. Because this pico is good enough to eat all on its on! Strawberries are in season and we love fresh fruit salsas. 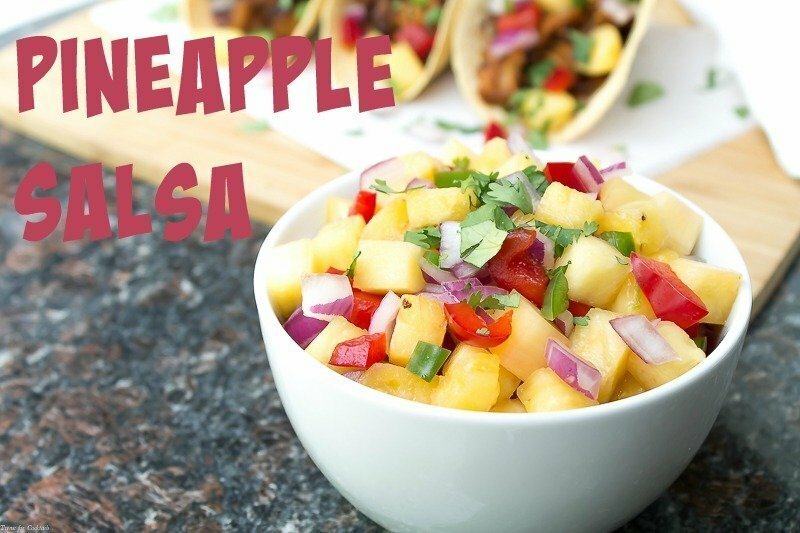 Have you seen my Pineapple Salsa? It is beyond luscious and perfect on your favorite pulled pork tacos. 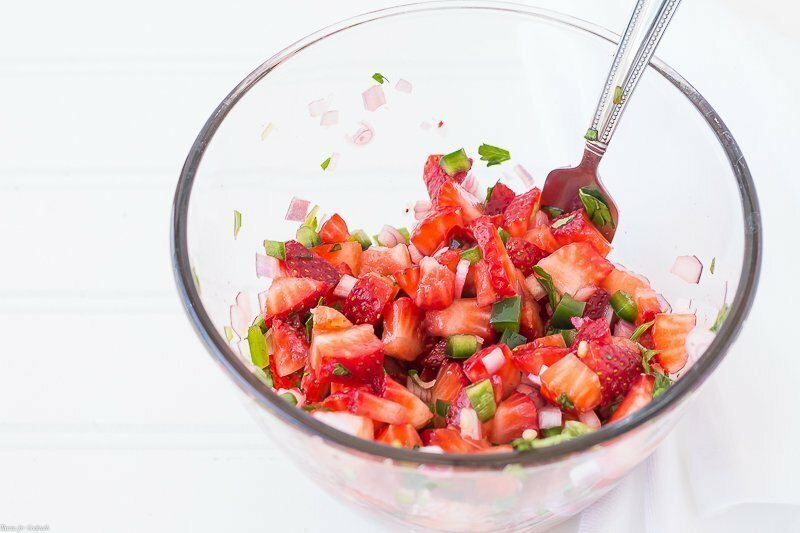 You could even serve this Strawberry Pico de Gallo on a toasted crostini with a little herbed goat cheese. 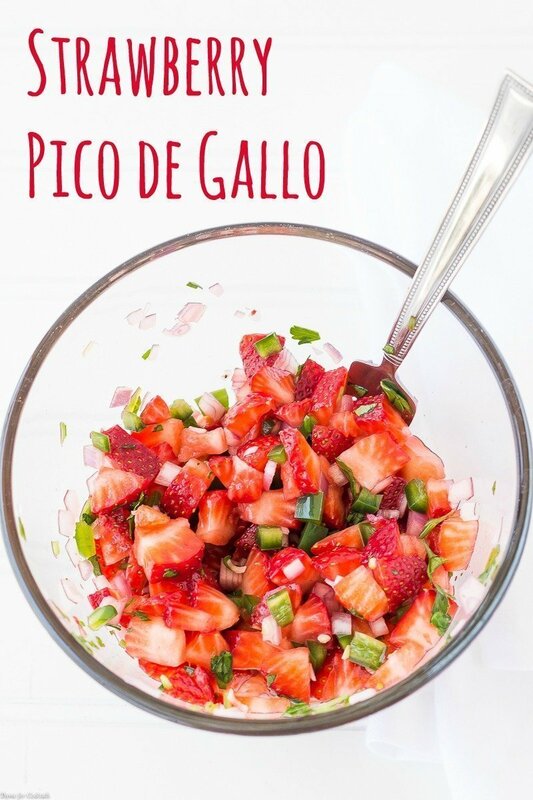 Seasonal strawberries combine with local produce in this sweet and spicy Strawberry Pico de Gallo. Made with diced strawberries, jalapeño peppers, shallots, parsley and a touch of honey. Add all ingredients to a medium bowl, stir to combine throughly. Adjust amount of honey for desired sweetness.